First, sharing the link to a recent article I was featured in about I how I use me-time for blogging. If you've ever wondered how I juggle blogging and two toddlers, it's a good read! Just like Friday's post, today I'm wearing more summer pieces in winter. This time around it's my maxi dresses. I like to wear my maxi dresses and skirts year-round. Helped by Brisbane's snow-less winter and a few cosy layers. Wore this for my first girls night out in a very, very long time! A friend was celebrating her birthday at a rooftop bar so I went for a few hours to celebrate with her. It was nice getting all dressed up again - this dress has been rarely worn since I got it while pregnant as it's not breastfeeding friendly at all. It was my first choice for a night out, as it's so pretty and definitely under-worn! I was going to wear ankle boots with this but there were a lot of dress code restrictions at the bar...so I wore flats to be on the safe side. Ankle boots would have been warmer though, especially when it rained a little. I really liked the black printed leather jacket with the printed maxi dress, the print on the jacket is subtle enough that it doesn't clash with the dress. I bought this leather jacket 4 years ago, in the ASOS sale reduced from $385 to $150. It's just passed 30 wears. While it's winter now in Australia it's summer in the UK so if you're looking for a leather jacket massively reduced, check out the ASOS sale! You can get pieces like this awesome studded leather jacket reduced from $245 to $101, or this plain black one which is now $138.50 instead of $443. 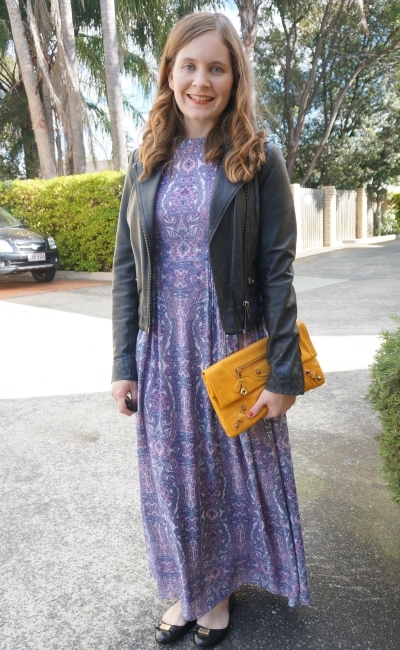 Last worn: printed leather jacket, printed halterneck maxi dress, black ballet flats, Balenciaga mangue envelope clutch. Other ways to wear: printed leather jacket and jeans, printed halterneck maxi dress in spring, black ballet flats and skinny jeans, Balenciaga mangue envelope clutch and printed jeans. Perfect for pregnancy: maxi dress in second trimester, clutch in the third trimester. More pink and purple! I've worn this dress and belt together so many times, it's a frequent go-to for me. I really like pink and purple together too, although it's the first time I've worn the cardigan and dress together. This is what I wore for Toddler T's third birthday party - no shoes as I stayed home all day and sent hubby out for the last minute things that morning. 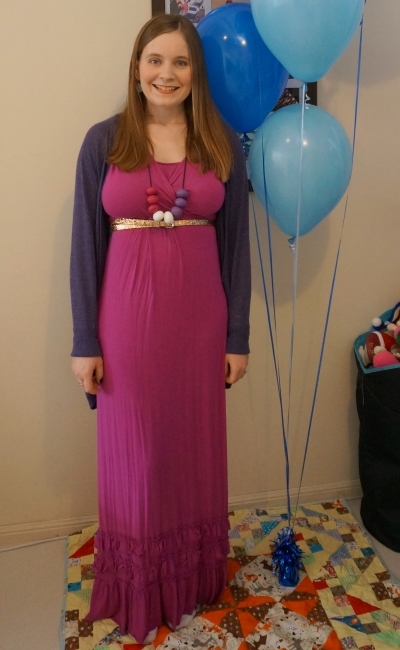 Picked this dress to wear as I love wearing a maxi dress for a birthday party - easy and quick to throw on while setting up last minute things, and stylish and simple for spending the day running around with two toddlers. Even wore this a couple of months ago for Baby Boy's first birthday! Just crazy to realise Toddler T is 3 now! Last worn: purple cocoon cardigan, gold glitter belt, pink nursing maxi dress. Other ways to wear: purple cocoon cardigan and graphic tee, gold glitter belt and Aztec print dress, pink nursing maxi dress and sequin scarf for another birthday party. Perfect for pregnancy: cocoon cardigan in second trimester, same dress and gold belt over a baby bump, maxi dress at 39 weeks pregnant. You don't need to give up your maxi dresses when summer ends! Have a look at the winter layers you have in your wardrobe - a cosy cardigan or a leather jacket can be a simple addition to a dress and make it warm enough for a mild winter day. Leather jackets can be expensive, but if you buy at the end of season sales or take advantage of the opposite seasons when shopping internationally, you can find one that fits your budget. If you have colder winter weather, wear ankle boots and even leggings underneath your dress, with a nice cosy blanket scarf too. When spring arrives you can continue to wear your dress with a light layer like a cardigan. You really can wear most dresses year-round! Linking up with On Mondays We Link Up, On Trend, Turning Heads, Trend Spin, Style Sessions, Confident Twosday, Oh Hey Girl, Spotlight Weekly, Fun Fashion, Fabulous Friday, Flashback Fashion, Passion for Fashion, Friday Faves, Mix It Monday. Congrats on the feature lovely! I love that first dress, what a stunning print and look for a girls night out. I love the addition of the jacket. Very nice! I don't think about wearing maxi dresses much in Winter, but I love these looks! I'm going to have to keep these in mind for the colder months! Looks great! I love the jacket! and that bag is such a cute colour :) Hope you are well! Love that first maxi dress! You look so pretty. How fun to have a girls night out and get to wear your clutch! I love getting to wear my non-baby friends items for fun occasions like that. I cannot believe he is 3! Your maxi for that day is perfect as well. Such a versatile and fun item. Both so pretty! I love the first dress paired with the leather! We are currently experiencing a heat wave, or at least what we call a heat wave here in Germany, so I have been wearing maxi dresses a lot as we.. But without the jackets! Ooh that maxi dress in your first look is so pretty, I love the print. I hope you enjoyed your girls night--much deserved after taking such good care of your boys all the time. Okay, off to read that article now! I'd love to do a better job of fitting blogging into my me time! I love that first maxi! I also love that leather jacket. Together it makes one perfect outfit for a girls night in cooler weather! Look at you in all this colour! How lovely you look, my dear. Wonderful to have a night out from the kidlets, too - you so deserve it. That printed leather jacket makes me squee with joy! Awesome feature, congrats! It's so important to get me time as a mummy as we won't be good mummies unless we're happy mummies! I love a good maxi dress! You look so cute! I also have such a love for leather jackets and want them in every colour, but they can get expensive! Sale shopping is the best, off to check out the ASOS sale now! The look for baby T's birthday is superb, the colors, the fit ! Nicely done Mica. I am totally with you! Pairing a maxi with a leather jacket is perfect for the winter and feminine while being edgy! Love these looks! I love the purse. SO funny, I found a random store in NYC during a walk and was able to find the GREATEST coats there! Looking cute, lady! And I love scoring jackets on the cheap- so gratifying! ohhh I love the magenta/fushia on you. I bought my first maxi dress online last week and it's arriving today! Congrats on your feature babe! I love pairing a leather jacket with a dress. Such a great way to add a touch of edginess. I'll definitely be giving that article you were featured in a read, I'm sure there will be some helpful tips that I'll need after baby girl arrives :) That's great you were able to spend some time with your friend for her birthday and you look so pretty in that dress you wore to your little one's party; happy belated birthday to him! Thanks so much for sharing and I hope you have a great week ahead! Hi Congrats! You look so cute in the leather jacket and I love your choice of shoes! Pray you are having a great week! I have just gotten a few more maxi dresses and I love seeing them styled for cooler weather! You are giving me so many ideas for fall! Love how they look with a leather jacket! What a great article, and I love your maxi dresses! You do look so pretty in that maxi, and it really is so fun to have an occasion to get dressed up for, and carry impractical handbags! You look so lovely in a maxi dress. I will have to read your post, as I seem to only be able to post 3 days a week and I have no toddlers! Love the print on the maxi and the pretty clutch! You have the best bags! You do a great job Jess - and you have two adorable dogs that can be just as much of a handful I'm sure, haha! I think the yellow clutch works well! It makes for a nice pop of color with your outfit! Super cute maxi dresses too, gotta get as much wear out of them as you can as the seasons change! Yay for a girls night out! They are so needed and you work so hard to take care of the boys so you totally deserve it! I love what you wore. It would be very similar to my "going out" attire now a days. (But, even before pregnancy, I cant recall the last time Josh and I went out??). I love the detailing on the leather jacket. Seriously it almost matches that of the dress so well! Such a stunning combo, really. A good leather jacket is the ideal layering piece for winter. What a smart idea to transition the summer maxi dresses! I love the detail on that jacket! I've never seen anything quite like it! So pretty! I love how you combined the leather jacket with the maxi dress! So cute! Two of my fav things .. maxis & leather jackets! Thanks for linking up with Fun Fashion Friday & have a wonderful weekend!